The North American leg of WITNESS: The Tour produced by AEG Presents will kick off on September 7 at Schottenstein Center in Columbus, OH and will make a stop in Sacramento at Golden1 Center on January 31. Tickets for the concert go on sale to general public, Monday May 22 at 10 AM. 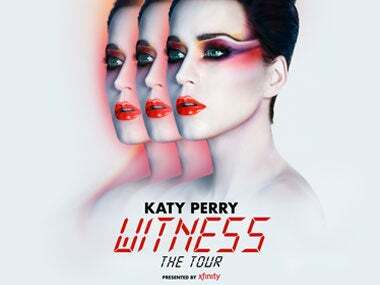 All U.S. concerts on WITNESS: The Tour are presented by Xfinity. Additional sponsors are Citi, COVERGIRL and KATY PERRY PARFUMS. See below for itinerary or visit http://katyperry.com. Additional international tour dates will be announced in the coming weeks. "Having just launched a new national advertising campaign with Katy, we're thrilled to extend our relationship to encompass the upcoming Witness Tour," said Jennifer Breithaupt, Global Consumer Chief Marketing Officer, Citi. "Citi cardmembers will have exclusive access to pre-sale tickets for what promises to be one of the biggest and most memorable tours of the year." Citi is the official U.S. credit card of WITNESS: The Tour. Citi cardmembers will have access to U.S. pre-sale tickets beginning Thursday, May 18 at 12pm local time through Saturday, May 20 at 10pm local time through Citi’s Private Pass® program. For complete pre-sale details visit Error! Hyperlink reference not valid..
Katy, who will be the musical guest on “Saturday Night Live” on the May 20 season finale, made her Capitol Records debut with 2008’s One of the Boysafter signing to the label in 2007. She cemented her status as a global superstar with the follow-up album, Teenage Dream (2010). PRISM, her 2013 album, debuted at No. 1 on iTunes in 100 countries and has sold more than 12.5 million adjusted albums worldwide. With the singles “Firework” and “Dark Horse” each surpassing the 10 million threshold including song sales and streams, Katy is the first female artist to earn two RIAA Digital Single Diamond Awards. In her 10 years with Capitol, she has racked up a cumulative 18+ billion streams alongside worldwide sales of more than 40+ million adjusted albums and 125+ million tracks. She is the most-followed person globally on Twitter.